Flying in, I was surprised to see snow still in patches on the ground. The passengers ahead of me in the passport check line were going skiing yet! There was a definite chill in the air as I waited for the train from the airport to Oslo City Center. However, just like Michiganders some people wore balloon-like winter coats and others stubbornly believe spring has arrived and dress in a simple sweater or hoodie. By the time I found my bearings and subsequently the hotel, I didn’t even notice the cold. My hotel was not going to be ready to check in for 5 hours so I left my bags in the baggage storage and decided to see some sights! 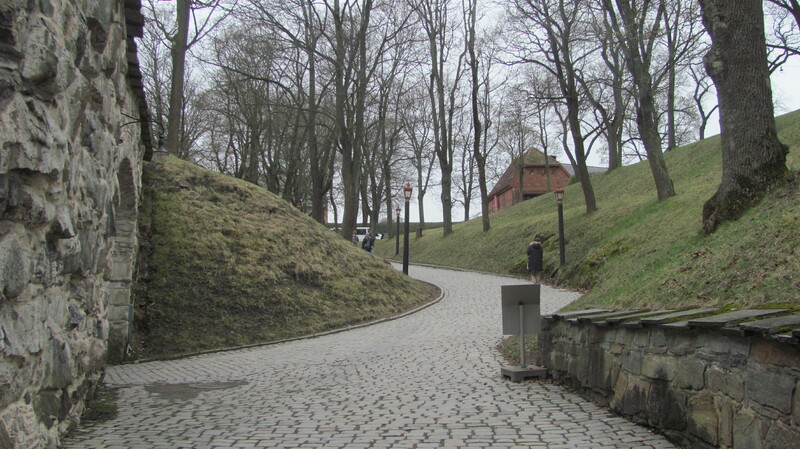 There is a big fortress, Akerhus Festing, on the East side of the city. The large stone structure is very expansive. It was used in WWII in attempt to ward off Hitler’s naval invasion, but succumbed after a couple months. 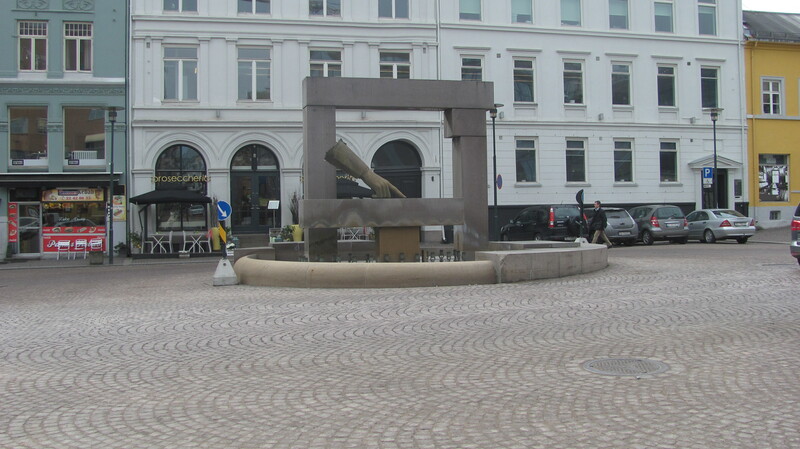 The UK and the USA liberated Norway at the end of the war. 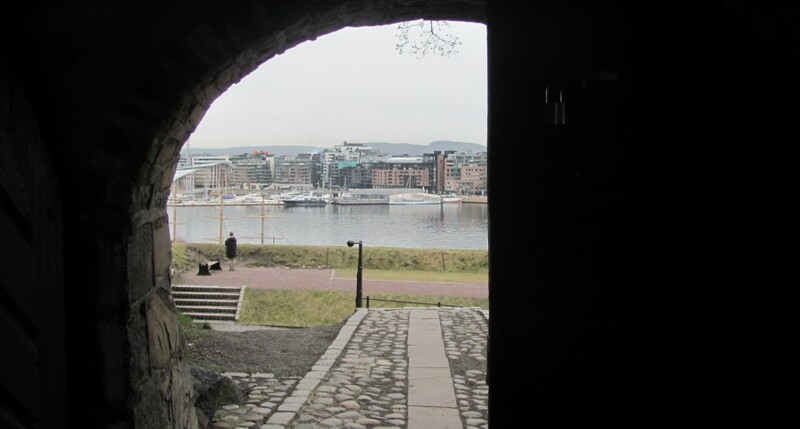 I was looking for Christiania Trov, a square full of restaurants, but ended up a few streets over and found the oldest existing restaurant in Oslo, Engebret Café. 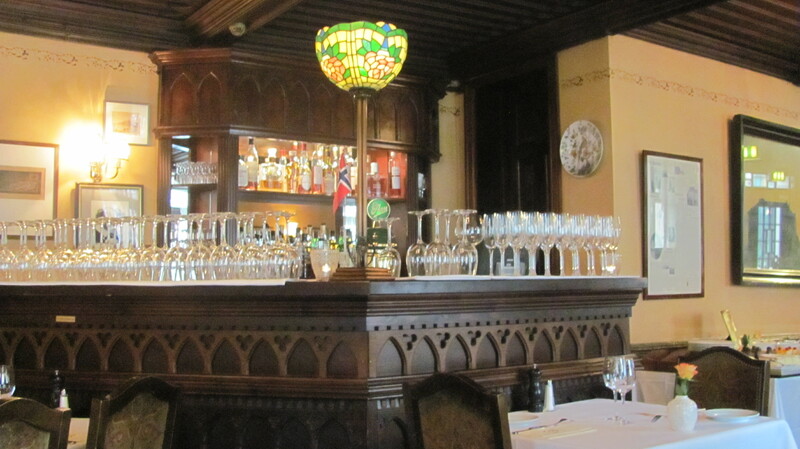 It was built in 1857 and is still decorated in the original style with detailed wooden ceilings and stained glass lamps. Lunch is a semi-formal sit down affair. You can order off of the menu or pick a sandwich from the sandwich bar. These were no ordinary sandwiches. A thick piece of bread was the base. Then mounds of shrimp or smoked/raw salmon was decoratively placed on top along with a cucumber garnish. The looked too good to eat. I couldn’t try these because I was pregnant so I asked the waiter who happened to be the owner what he recommended. I took his advice and ordered a fish soup. Delicious! 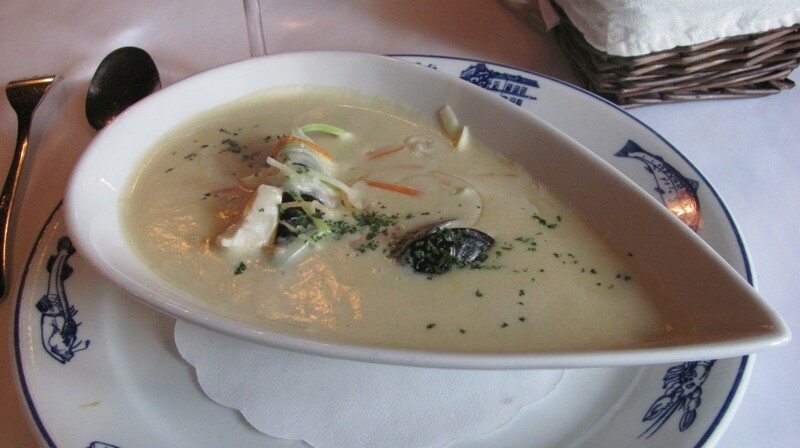 It was a creamy soup filled with chunks of cooked salmon, white fish, shrimp, and muscles along with thin slices of vegetables as a garnish. If I could have eaten more, I would have ordered 3 more. It really was that good. 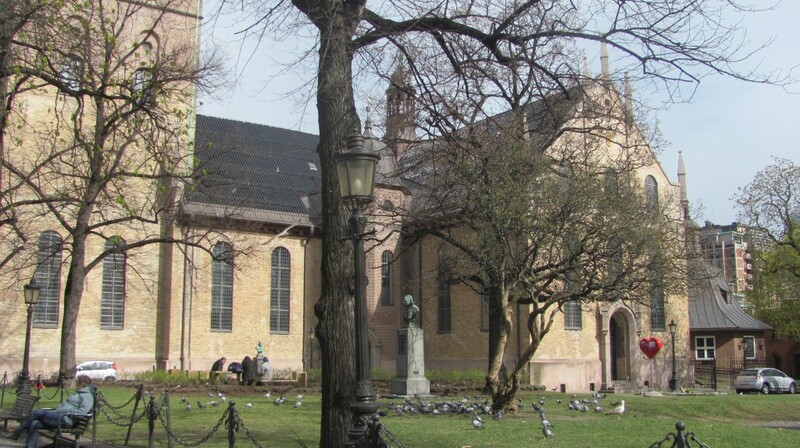 After lunch, I did make it to the Christiania Trov and saw the statue and then decided to go see the main Cathedral in Oslo, Oslo Domkirke. This cathedral had ceilings that were hand-painted, but done in several different stages of the years so it had a more current look to it than many of the old cathedrals I have seen before. 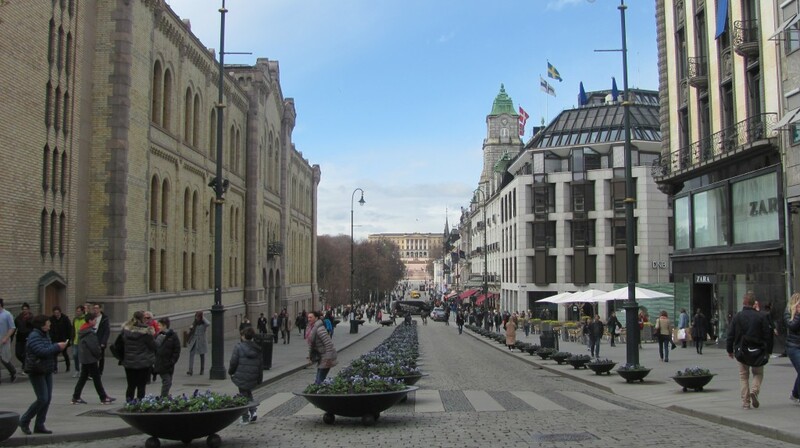 It was time to shop 😉 I went to the main shopping district, Karl Johan’s Gate. I knew this was a street name, but I honestly kept looking for a gate especially since the street goes from the East side where I started and ends in the West side at the Royal Palace. When I got to the end, I dawned on me just how dumb I was. “Gate” is the name for street and I had been following many “Gates” all day long so it really should have been an obvious realization from the beginning. Anyways, this “Street” is bustling with so many unique stores, cafes and restaurants. There is a city-like park which is cement, but the entire length is a fountain area where street musicians play. 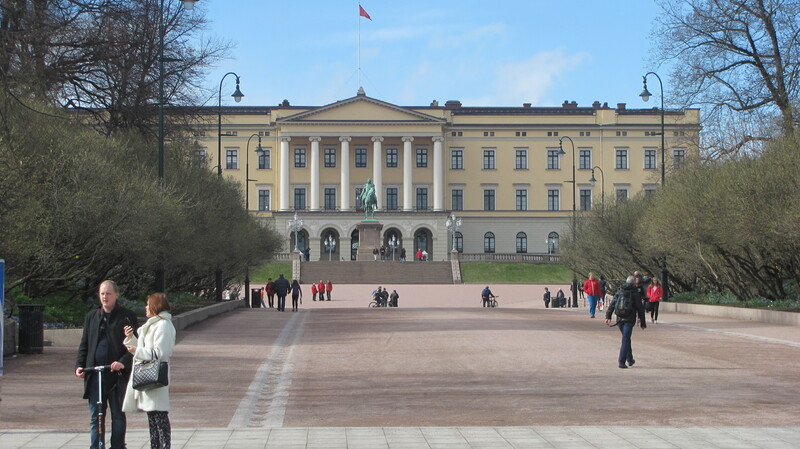 This area also ends at the National Theater which is just left of the Royal Palace. This beautiful atmosphere caused me to buy some of the cutest baby boy clothes 😉 I also got Wes a couple of handkerchiefs and my very own first pair of prego pants or at least pants with an elastic waist. I hadn’t slept much on the plane, so I retuned to the hotel to rest and put up my aching feet. I can’t wait for tomorrow. 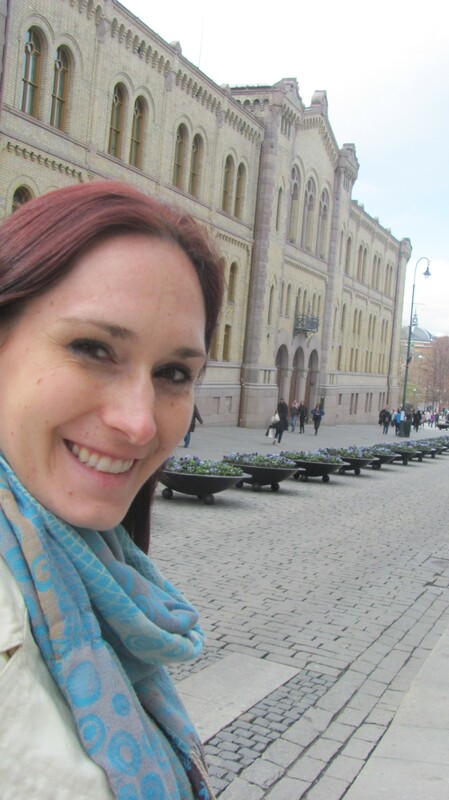 I am planning on seeing some of the Viking heritage sites!